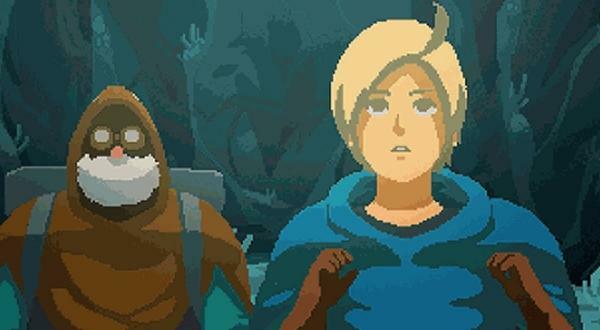 Another Kickstarter campaign, another gorgeous looking 2D platformer worthy of your attention. Aegis Defenders from GUTS Department is everything that I love to see and get excited for from the website: a lovely little game with age-old familiar mechanics and just enough brilliant new twists, a staff of guys with experience in small time game development, and a reasonable and obtainable monetary goal that matches with the final product. Most importantly, and I can’t stress how important this is, it has a lot of footage and material to show off, proving that the team is already neck deep in development from their own funds and is just looking to seal the deal. When these circumstances align, like GUTS Department does with Aegis Defender, you get my attention. This game puts you in control of grandfather/granddaughter duo Bart the Engineer and Clu the Hunter as they explore a war ravaged planet where human memory has been wiped out and technology and machinery are treated as godly items. Already on the run after a ruthless robotic demi-god known as Shem destroyed their home, they desperately seek a mythological weapon buried somewhere in the planet’s vast wilderness, hoping against hope to put an end to his deadly pursuit. The twist comes from the tower defense elements in battle stemming from the character’s occupations. As a engineer, Bart sets up powerful turrets and barriers to defend himself, Clu, and whatever objective the evil forces of Shem are after. On the other hand, Clu is more like an ever-improving turret with the ability to tour the battlefield, shooting enemies and setting up traps. You’ll be switching between the two on the battlefield in hopes that their combined skills will get you out of every situation alive. This simple setup creates a wide variety of battle types, ranging from simple and traditional 2D runnin’ and gunnin’ to more mind-bending puzzle scenarios backed by the tried and true mechanics of tower defense. Environmental elements and even level design is also set to make a huge impact on combat, so hopefully you’ve uncovered enough technology to aid the duo in a pinch. Aegis Defender‘s gorgeous art style obviously takes a few pages of inspiration from Hayao Miyazaki’s classic animated film Nausicaa of the Valley of the Wind, which is proving to be a hugely influential on the indie scene with Hyper Lighter Drifter also snatching up ideas from it as well. The in-game graphics are simply drawn sprites with lush environments to peel through, but it is the cutscenes which best represent what GUTS is capable of thanks to its uniquely hand animated pixel art. Best of all, the scope of the game is being capped and stretch goals are only expanding on availability and other non-game elements like an orchestrated soundtrack, local co-op, horde mode, and achievements. No need to blow this game out of proportion and risk getting too big. I’m going to support Aegis Defenders, and it seems like Kickstarter does as well after it was given the coveted “Staff Pick” tag. Currently it sits at $46,000 of its $65,000 goal with a healthy 31 days to go. If it reaches the base goal, it will be released for PC, Mac, and Linux, and stretch goals of $100,000 and $150,000 will put it on the PlayStation 4 and Wii U respectively.